I love everything lemon and these taste delicious! 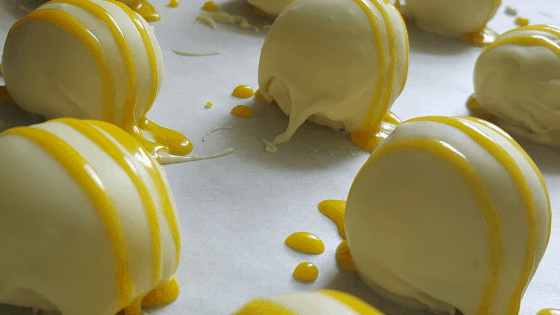 These lemon truffles are quick and easy to make and they use real lemon! Heat heavy cream over low heat until a simmer. Stir in 8 ounces of white chocolate and lemon zest. Remove from heat and stir until chocolate is melted and well blended. Chill in refrigerator until mixture is firm enough to hold shape. Roll into 1 inch balls. Cover cookie sheet with wax paper and set aside. Heat remaining 8 ounces of white chocolate in microwave for 30 seconds. Stir, 30 seconds more. Set truffle on fork and lower into chocolate. Use spoon to pour chocolate over truffle. Use fork to shake off excess chocolate and then set on wax paper. Prepare lemon glaze by mixing together lemon juice, powdered sugar and food coloring. Mix until colors are blended and smooth. Using fork, drizzle truffles with lemon glaze. Chill truffles in refrigerator for approximately 30 minutes before serving.